There needs to be an addendum to the old saying "Don't cry over spilled milk." Don't stab people over spilled cheese dip, especially if it's not Pancho's. Seriously people, don't do that. An unidentified 35-year-old Memphis woman was rushed into surgery at Methodist hospital Sunday morning after she wrecked the car she was driving to the emergency room. She'd been stabbed by another woman, Yolanda Tucker, who, according to a police report, became unreasonably upset after the victim spilled a container of Rotel. The two women were sharing the dip with a man, Michael Weston, who loaned Tucker his pocket knife. Both Tucker and Weston were taken into custody. Memphis wrestler Jerry Lawler's WWE suspension has been lifted. That means the 66-year-old Hall-of-Famer should be able to reclaim his throne now that charges of domestic assault have been dismissed. 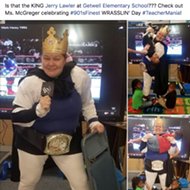 Lawler and his 27-year-old fiancée, Lauryn McBride, were both taken into custody early Friday morning following kicking, scratching, and candle-throwing at Lawler's East Memphis residence. Police were unable to determine who was the aggressor. It's been a big week for Memphis' most famous presumably deceased celebrity. First, a New York Daily News report quoted Elvis' step-brother, David Stanley, claiming that Presley's overdose was intentional. Stanley later took to social media, claiming he had been misrepresented and had no certain knowledge of Elvis' intentions. Also, reports continue to circulate claiming that Elvis is alive and working as a ponytailed groundskeeper at Graceland. According to various media sources, he sent a secret "I'm alive" message by scratching his face.